Come one Come All – We welcome you to join us as it’s a beautiful day to Empower, Engage, Tinker and Tickle Children, in short – have lot’s of FUN – all while Supporting for a Cause. Disclaimer – This is not for Profit event – all Performing Artist, Creative Children volunteers, Organizers and Sponsors volunteer there time and effort with no monetary returns. – Creative Children Stalls for Games and Craft. Remember your old school fete? It’s only better now, Our Creative children challenge you – R u Game ? 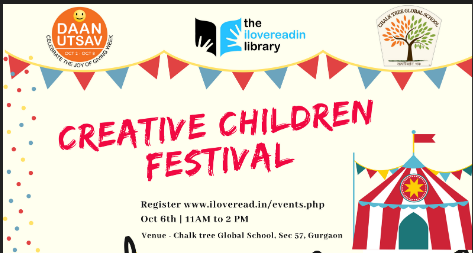 Event curated by iloveread.in (Online library of physical books Delhi NCR #ilovereaddelhi) in association with CHALK TREE GLOBAL SCHOOL, GURGAON.